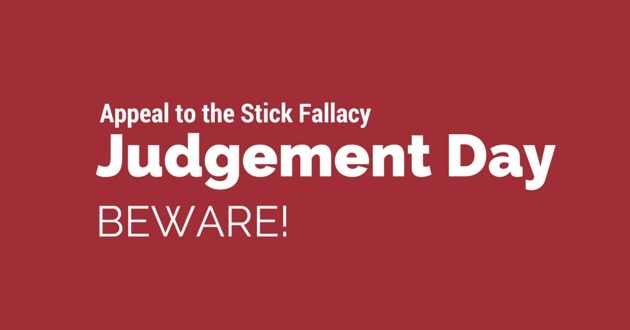 The Appeal to the Stick Fallacy, Beware Judgement Day! Over the years, I’ve encountered my fair share of debate on topics within Christendom. I’ve grown pretty good at determining who is asking questions to learn, and who’s asking questions to antagonize. As a result, I generally limit my responses to all correspondence to about one, before leaving the conversation. There is a typical trend by the Religious when confronted with evidence that contradicts their beliefs. Their first response is always, the fallacy of incredulity, where they say something like, “I just can’t believe people think that way!” This is particularly common when dealing with issues of Scripture and context. While most Christians read the Bible in little snippets and nuggets, when principles of interpretation are offered that contradict their popcorn verses, they panic and try to deny it by appealing to their lack of imagination. The second typical response by the Religious is the ever infamous: fallacy of composition. They try to take something that is true for the entire Bible and apply it to individual Scriptures, in an attempt to avoid the problem of context. So they say grand statements like “The Bible Is Inspired!” or “The Bible is the Word of God!” While these grand statements maybe true for the overall canon of Scripture, they do not negate the context and audience relevance of individual verses. There are usually a few attempts at the No-True-Scotsman fallacy, where they try to imply that unless you believe as they do, you’re not a “Real Christian”. Then comes the Either-Or Fallacy, saying: Unless you believe like them, you’re basically the same as the devil. There is no limit to their attempts at fail reasoning all because their beliefs are most important to them than the reality of Scripture. Now, while this statement may be true, it reveals more about the person making the threat, than anything to do with the interpretation presented. The fact that they are using “Judgement Day,” or whatever it might be, only reveals what that person truly fears. And given the alarming amount of times this threat has been lobbied at me by Christians, it suggests that Christians are somehow afraid of Judgement Day. Trying to threaten me with Judgement Day is the equivalent of trying to threaten me with Payday. There is no threat or fear in me concerning Judgement day at all. Just as my faith in Christ has completely removed any notion of fear of Hell, in the same way, I have absolutely no fear Judgement day. In fact, according to Scripture, it is only those who have not been perfected in Love, that will be fearful. But what is most telling of all, is how many other Christians have not been made perfect in Love through the Revelation of Jesus Christ. If Christians are not at peace over this matter, it’s not their doctrine that needs to be adjusted, instead it is this understanding of Love.